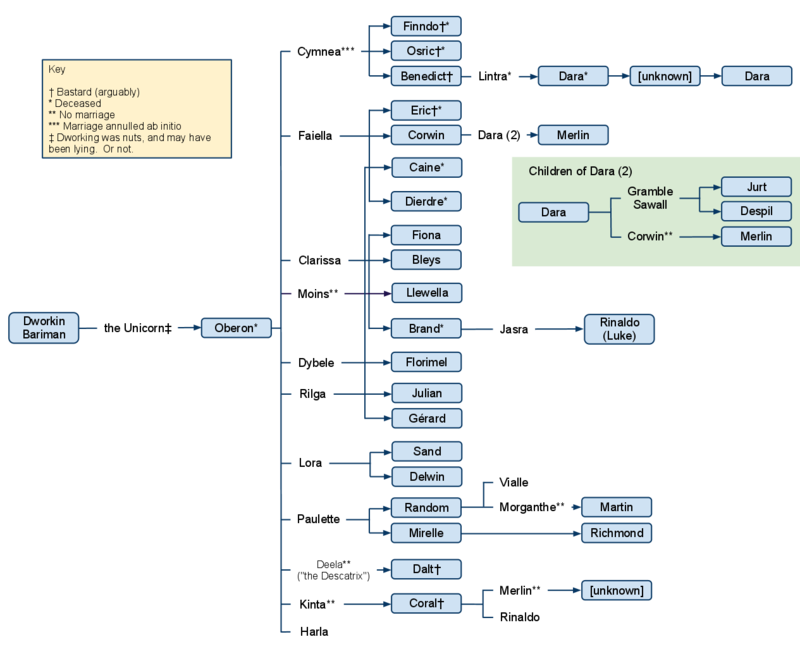 This page features different versions of the Genealogy of the Royal Family of Amber. I attempt to conclude with a version that most closely approximates the genealogy based upon Amber canon. If you can suggest corrections, please email me. John S. Quarterman is developing a detailed chart of the Amber Genealogy. Many thanks to Kevin L. Nault who has provided a family chart and it is posted here. An Amber Timeline I adapted can be found here. This is an attempt to build a version based upon Amber canon. The timeline should be adjusted and examples in the books lean to further adjustments. Using Krulik’s version as a base, except Caine ‘should’ be one of Rilga’s children. Randall’s version doesn’t take into account the actual sequence of births, just the occurrences of Oberon’s mates. Coral should be the ‘youngest’ of the children. Corwin mentions that Benedict is the oldest. I invite suggestions on how this interpretation can be adjusted to be more precise, email me.